Book your boating excursion today! Daymaker Charters offers 2 incredible fishing excursions designed to fit your schedule and budget. Each option offers a unique and exciting offshore fishing experience for you and your guests. You’re on the water bright and early to go out to fish the Gulf stream all day for the big catch: tuna, wahoo, dolphin, marlin and sailfish. Great to book in March, April, May, and June, this trip can be done throughout the entire year, too. 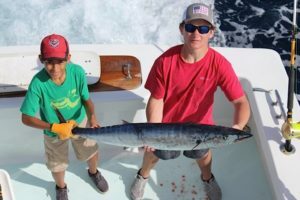 This charter is an ideal way to get in depth exposure to sport fishing as well as experience the beauty and challenge of the Gulf stream waters and its amazing fish. 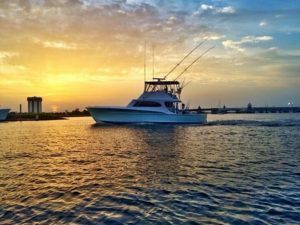 If your dream is to haul in a bonita, dolphin, amberjack, barracuda or maybe the occasional wahoo or sailfish, Captain Bobby and his crew know where to find them and how to catch them, in fishing waters from 90 to 140 feet. This excursion is perfect if your schedule is tight but you want the action and excitement of blue water. Not available April through May 30. For credit card payments, please pay using the PayPal buttons. You do not need a PayPal account to purchase via that method. If you choose to not pay through PayPal/credit card please call us to schedule your charter before mailing your check. All charters are required to pay a $500 deposit at the time of booking to secure date and charter.